The photos reveal a black and white masterpiece. NASA is beginning to receive the photos taken of the former planet Pluto by the New Horizons spacecraft. What they are seeing has left them reeling. The close-up images taken by New Horizons’ July flyby reveal a range of complexity unexpected in any planet, let alone the much maligned ice world of Pluto. 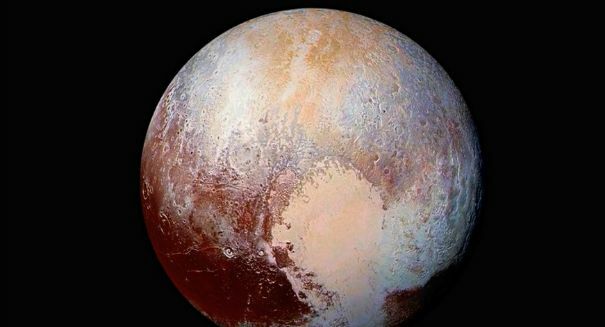 “Pluto is showing us a diversity of landforms and complexity of processes that rival anything we’ve seen in the solar system,” said Alan Stern, New Horizons Principal Investigator of the Southwest Research Institute. Pluto appears to have a heart shaped area covered in ice as well as numerous areas of pits and craters of varying depths. “[The images] reveal new features as diverse as possible dunes, nitrogen ice flows that apparently oozed out of mountainous regions onto plains, and even networks of valleys that may have been carved by material flowing over Pluto’s surface,” said NASA. The effect creates a black and white masterpiece. “If an artist had painted this Pluto before our flyby, I probably would have called it over the top — but that’s what is actually there,” said Stern. New Horizons is now some 43 million miles past Pluto, however, due to the distance, scientists are only just know beginning to receive the troves of pictures and date acquired by the spacecraft. The entirety of the download will take almost a year to complete. Scientists at NASA are not certain what cause the variations in topography. Indeed, even once they receive all of the data from New Horizons they still will only have theories. To say the least, the close-up photos of Pluto have changed the way we view the dwarf planet – and possibility the other members of our solar system as well.